After a long day, one of the best things you can do to pamper yourself a bit is with a soothing shower. The best handheld shower head gives you just that, and more. With hand showers, you don’t only get the benefit of water flowing down from over your head. You also have the ability to hold the showerhead in your palm to specifically direct the stream of water where you want. Below, we have a quick list of our top picks when it comes to handheld showerheads. The products below offer different features including spray modes. Plus, of course their prices vary. This hopefully, will give you a diverse enough selection to choose from. Our reviews further down offer more details on these products. 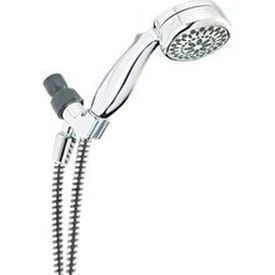 You can click here to go to Amazon.com’s page on their top rated handheld showerheads. The Delta 58467 In2ition shower head is one of the best handheld shower heads available in the market. It makes our top reviews thanks to its versatility as well as water performance. and full spray with massage. Not only does it has 4 different spray settings, it also comes with a lever that allows users to choose between three usage options. As a result, you get a lot of flexibility depending on your bathing preferences. You can change how the water flows as well as from where the water comes out from. This Delta shower head comes in both chrome and stainless materials. The hose that’s included with the product is able to stretch from 60 inches to 82 inches. Overall, the Delta 58467 In2ition showerhead is the perfect shower fixture for those who want to be able to get water wherever they need it, the way they want it. This product also comes with a lifetime limited warranty that allows buyers to purchase with confidence. Next on our reviews is an offering from Waterpik. This is another versatile product that offers more than just a stream of water from above. This is a good choice if you like being able to choose between varying water spray option. The Waterpik SM 653 CG showerhead is a round 3-1/2-Inch massage shower head. This Waterpik offering is 5 feet long with the hose extended. And it comes equipped with a variety spray modes. As you can see from the options listed above, whether you’re looking for a heavy or light massage, this showerhead has you covered. With a chrome finish that looks sleek and will match any interior, this bathroom fixture features OptiFlow technology that provides up to 30% more water force. Also, you a smooth 2.5 gallon per minute water flow rate. This device is optimal for a variety of uses. It gives you the opportunity to wash your whole body from head to toe as well as help you give your children and pets a good bath. The Grohe 28179000 Relexa Plus shower head is adjustable and offers a variety of luxurious spray settings that meet every bathers’ needs. You’ll notice that its variation of sprays are somewhat different from those of the others. Though you get similar features as well including the pulsator which is similar to the massage setting found in most other products. The unit comes with a 3 1/4 inch diameter shower face. This face evenly sprays water outward so that you get consistent coverage during use. Also this Relaxa product is easy to clean. This is due to the fact that it is made with SuperClean technology that protects it from limescale. To ensure the most enjoyable shower experience, this shower fixture comes with a hose that does not tangle or twist. With it, you can enjoy a hassle free, relaxing, and luxurious shower. This isn’t the cheapest handheld showerhead available. However, it makes up for that with its quality build as well as excellent shower performance. This is a detachable handshower that you can easily set on the wall mount or hold in your palm. Either way, it offers an excellent stream of water. And gives you the ability to clean yourself completely. The Hansgrohe 06425005 Croma shower head can be used in a variety of situations. These include bathing yourself, your children, or your pets. This is thanks to its good sized 63 inch long hose. The hose gives you the ability to move it around. So instead of you turning in all directions in the shower, you get to control the shower instead. As a result, with it you can easily wash from head to toe. Not only can this handheld showerhead be extended, it also comes with the flexibility and a non-kink feature. All in all, these allow for easy and hassle-free use. The handheld shower fixture also features QuickClean technology that removes dirt and limescale residue. Because of this, it makes this product easy to clean.